John Mullane says that a lack of pace in the Tipperary team could derail their attempts to re-establish themselves in the All-Ireland championship in 2019. 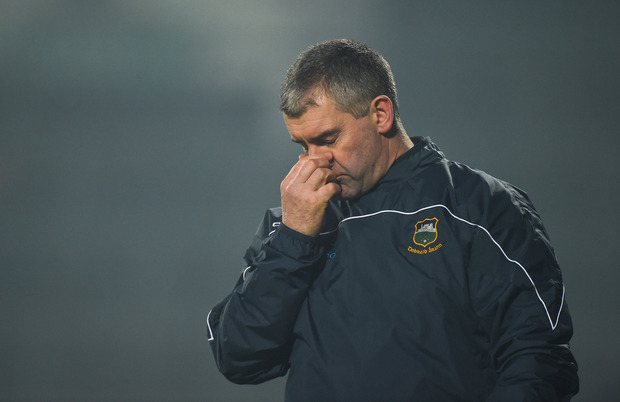 Liam Sheedy returned in the off-season for a second spell in charge of the Premier county after Michael Ryan stepped down following an early elimination from the Munster championship. Sheedy, who led Tipperary to an All-Ireland title in 2010 before walking away from the role, is now tasked with rebuilding the team, and has registered one win and one loss in his first two league games. Tipp beat Clare on the opening night of the competition at Semple Stadium, but were blown away by a Limerick surge at the Gaelic Grounds last weekend. Speaking on The Throw-In, Independent.ie's GAA podcast in association with Allianz, Mullane says that he thinks Tipperary are too 'one-paced' as they continue to rely on a core of experienced players who won the All-Ireland during Sheedy's first stint. "What's coming out of the weekend is that Tipperary were very leggy and that there was a lack of pace," Mullane said." "What I find with this Tipperary team is that a lot of them are very one-paced. When you compare the project that Liam Sheedy took on in 2008 versus the project he took on now, they had pace in that team in 2008. They had Michael Cahill and Paddy Stapleton at corner back, two tigerish corner backs with lots of pace. "They had Shane McGrath and James Woodlock in midfield, lots of pace. They had a young Seamus Callanan. The worry I'd have about Tipperary for the rest of this league and going forward for the summer is the lack of pace within the team. The likes of Callanan, Padraic Maher, Bonner Maher, there is another year on them." One position that Sheedy will look to shore up during the league is fullback, which has been a problem for the team since winning the All-Ireland in 2016. James Barry, who won an All Star at number three during that season, was back in the role on Saturday night. Mullane says that solving the fullback dilemma is crucial for Sheedy, and that defender Cathal Barrett also has a big part to play in 2019. "There's a huge importance to having Cathal Barrett in that team," Mullane added. "Whenever he is out of the team, they seem to struggle. He offers so much to that team. He is your teak-tough, normal Tipperary corner back. He has speed an he is aggressive. That is what they are lacking. Liam Sheedy needs to unearth one or two more defenders like that if they are going to challengers." For Limerick, it was another impressive statement of intent as they ran out seven-point winners against their Munster rivals to add to their opening weekend victory against Wexford. There doesn't appear to be any hangover for Limerick after ending their 45-year wait for All-Ireland glory in 2018, and Mullane has been very impressed with what he has seen from John Kiely's men. "Limerick have skill, strength and speed," Mullane said. "The reason why they can go and attack this league ahead of some of the other teams is because they have a very strong panel. It allows John Kiely to go an play ten or 11 of his All-Ireland-winning team and then rotate it. He will have seven of his potential 1-9 each week in his team. He will persist with his half back line, which is the launch-pad for Limerick. "The key word that John Kiely keeps mentioning is attitude. I can't get over their attitude, how they have really attacked this league campaign and how they have really applied themselves as All-Ireland champions."